Supporters of Hillary Clinton are far more likely than those of Donald Trump to be concerned about climate change, to believe climate change is mostly the result of human activity, to say a range of policy and individual actions can be effective in addressing climate change and to think scientists understand climate change, according to a new Pew Research Center analysis. Differences between Clinton and Trump supporters mirror a deep divide between Democrats and Republicans in their views on climate change and climate scientists. The Center’s new survey on climate change attitudes shows that these political fissures reach across every dimension of the debate. These differences starkly frame a key set of disputes in the presidential election. Fully 56% of Clinton supporters say they care a great deal about the issue of global climate change. An additional 34% say they care some. In contrast, only 15% of Trump supporters care a great deal about the issue of global climate change, 34% care some and about half (49%) care not too much or not at all about this issue. 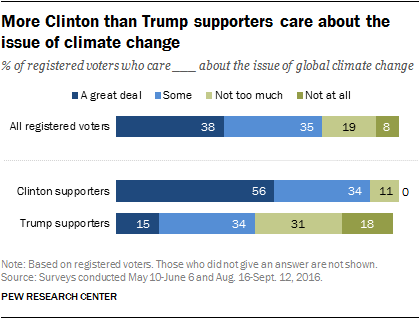 Further, Clinton and Trump supporters have vastly different beliefs about the causes of climate change. 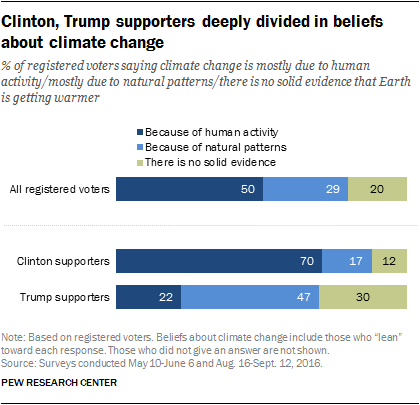 A large majority of Clinton supporters (70%) say the Earth is warming mostly because of human activity, but just 22% of Trump supporters share that view. Nearly half of Trump supporters (47%) say the Earth is warming because of natural patterns, and three-in-ten (30%) say there is no solid evidence the Earth is warming. 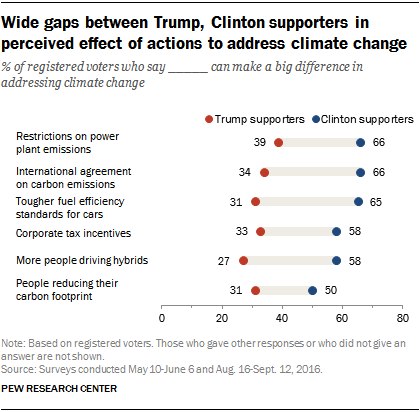 Wide differences between Clinton and Trump supporters extend to views on the effectiveness of individual and policy actions to address possible climate impacts. Clinton supporters are more likely than Trump supporters to say that any of six actions can be effective in addressing climate change. For example, many more Clinton supporters than Trump supporters say that these policy options can make a big difference in addressing climate change: restrictions on power plant emissions (66% of Clinton supporters say this vs. 39% of Trump supporters), an international agreement to limit carbon emissions (66% vs. 34%) and tougher fuel-efficiency standards for cars and trucks (65% vs. 31%). Similarly, Clinton supporters are much more likely than Trump supporters to say that corporate tax incentives to encourage businesses to reduce emissions resulting from their activities can make a big difference in addressing climate change (58% vs. 33%). Clinton and Trump supporters also have widely diverging views of scientists who study climate change. About half of Clinton supporters (51%) say climate scientists understand very well whether or not climate change is occurring compared with just 17% of Trump supporters who believe that. Clinton and Trump backers are similarly divided over whether climate scientists understand the causes of climate change: 41% of Clinton supporters say climate scientists understand this very well compared with 15% of Trump supporters. Few voters give climate scientists high marks for understanding the best ways to address climate change. 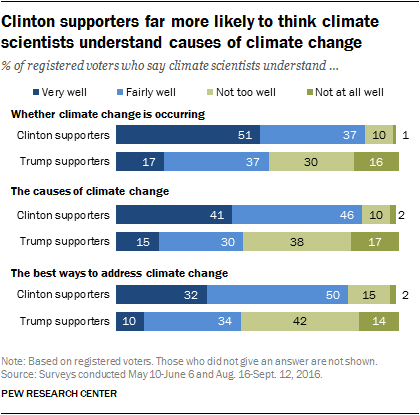 About a third of Clinton supporters (32%) and just one-in-ten Trump supporters (10%) say climate scientists understand the ways to address climate change very well. Note: These findings are based on 1,324 registered voters (including 582 Clinton supporters and 488 Trump supporters) on Pew Research Center’s American Trends Panel who completed both a survey on presidential vote support conducted Aug. 16-Sept. 12, 2016, and a survey on beliefs about climate conducted May 10-June 6, 2016. The margin of sampling error for all registered voters is plus or minus 4.4 percentage points; for Clinton supporters it is plus or minus 6.9 percentage points and for Trump supporters it is plus or minus 7.2 percentage points.